Becky Wright’s mother suffered a heart attack as Wright stood holding her hand in 2004. Her mother survived, but watching her suffer left a lasting impact on Wright. Today, Wright has made promoting heart health her special project as president of Mississippi Federation of Women’s Clubs Inc., a member of the international General Federation of Women’s Clubs. Her goals are to raise awareness about heart disease, encourage others to make healthy lifestyle choices and raise funds for the American Heart Association. Wright’s efforts include the recent publication of “Dixie Dining III,” a cookbook featuring 777 recipes contributed by MFWC members throughout the state. Many of the recipes are noted as being heart healthy, including Baked Chicken Fajitas, Slow Cooker “Refried” Beans, and Quinoa and Bean Salad. 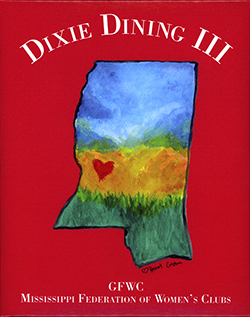 “Dixie Dining III” is available throughout Mississippi from GFWC-MFWC members for $20. For information on ordering, contact Becky Wright at 662-983-8836 or Frances Brown at frannabrown@hotmail.com. Wright is a member of Pontotoc Electric Power Association.